From the moment you arrive to long after you depart … Kansas City’s holiday vibe and scene is sure to make a lasting impression. Just like its mouthwatering barbecue, Kansas City has earned a bold reputation for its impressive holiday light displays and can’t miss events and attractions. I’ve already told you all about the holidays happenings in Crown Center. But Crown Center isn’t the only place in Kansas City that offers Holiday fun. Here are the rest of my suggestions on what to do during the holidays in Kansas City. 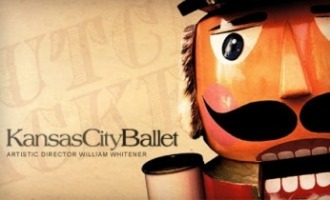 The Kansas City Ballet’s extravagant production of “The Nutcracker” this holiday season tells the story of Clara and her Nutcracker Prince as they journey to the Kingdom of the Sweets through enchanting costumes, stunning sets, choreography by Artistic Director Emeritus Todd Bolender and Tchaikovsky’s memorable score. More than 200 area children who are students in the Kansas City Ballet School perform alongside 25 Kansas City Ballet Company dancers. This year marks the first time the holiday classic will be performed in downtown’s stunning new Kauffman Cen ter for the Performing Arts. As soon as the lights dim, you’ll be transported to a magical place. From the magnificent sets and costumes to the acclaimed Kansas City Symphony, you’ll witness some of the most glorious dancing on earth. While it may capture the imagination of children of all ages … use your own judgement before ordering your tickets. Taken from the KC Ballet’s website: Many children over the age of five can remain happily and quietly seated for a two-hour performance but you know your child best. “The Nutcracker” is an excellent introduction for children. Please note all persons entering the theater must have a ticket, including babies in arms and small children sitting on a parent or guardian’s lap. These tickets are sold at full price for the seating selection. Parents will be asked to remove children creating a disturbance during the performance. No refunds will be available. My children did extremely well … thank GOODNESS. You know your child(ren), so use your own judgement before ordering tickets. In my opinion, I believe ballet is a great introduction to art, culture, and music in a fun and educational experience. * The holidays aren’t just about Santa. For others, there’s a story about a Fairy Princess, which is a tradition that began in 1935 at Kline’s Department Store. In 2006, Zona Rosa and the Kansas City Museum formed a partnership to help the Fairy Princess spread her joy to children at the new Northland shopping district for something adults and children can enjoy today. The Fairy Princess has select days and times so make sure to check the website for more information. * The Country Club Plaza’s popularity and reputation has been recognized around the country. The entire 15-block district, with more than 150 shops and dozens of fine restaurants, makes the Country Club Plaza Kansas City’s premier retail, dining and entertainment destination. 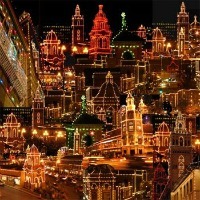 During the holiday’s, the “Season of Lights” at Country Club Plaza lights up 80 miles of lights decorating 15 blocks of the city. The Plaza Lights first started with a string of 16 lights over a doorway in 1925. The first Plaza Lighting took place in 1930 and has continued ever since – in exception to 1973, when President Nixon called upon all Americans to curtail the use of Christmas lights to reduce dependence on foreign oil imports. The big switch on the stage at the Plaza Lighting Ceremony really does turn on all the lights and the child chosen from the audience is ALWAYS chosen at random. The Season of Lights at the Plaza is a breathtaking and beautiful experience. My toddler’s second birthday was spent in Kansas City this last weekend and there’s no doubt in my mind he’ll be talking about it for years to come (::wink wink::). We gave him his presents. We sang Happy Birthday. And we make sure he was having a great time. Only one thing we didn’t have. The cake. So when we were given half a dozen of mixed cupcakes from Baby Cakes … we were SOOO eager to dive right in! A little background on Baby Cakes: BabyCakes opened in 2006 in Kansas City’s Historic River Market and is still locally owned and operated today. They bake their cupcakes fresh daily, on-site, in the store and use ONLY real butter, cream cheese, and organic vanilla extract in their icings. All I can say is, our half a dozen cupcakes didn’t last long. It was hard to choose our favorite but I will say that mine was Pumpkin and the Strawberry. My husband thoroughly enjoyed his Lemon and my little guys loved the Chocolate ones. Is your mouth watering yet? Mine is. And it’s almost worth a day’s trip to KC to order a dozen of their delicious cupcakes. So while you’re in Kansas City, don’t forget to stop in and taste why BabyCakes has enjoyed local and national praise as Kansas City’s first and best cupcake shop. 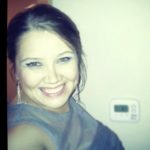 Amanda is a freelance writer and blog owner of: The Procrastinating Mommy” – a PR friendly family blog. You can also follow her on Twitter at: @Amanda_aka_Mom. Disclosure: Our visit to Kansas City, MO and these locations were sponsored by the Kansas City CVB. However, all thoughts and opinions are my own (and my toddlers of course).